Beginning on Christmas Day and ending on Christmas Eve a year later, "365" takes the reader on a spiritual journey with cranky old lady, Beverly Roberts. With laughter and tears, not one, but a half-dozen stories lead us through this year in the life of one Southern rural church and shows us the kingdom in a unique and humorous light. Beverly is a recognizable fixture in any small Southern town, but she quickly loses two-dimensional restraints. We discover her broken heart is hungry to be mended, and because of that, she has a story to tell. Rev. Pat Jobe has challenged and entertained people for 30 years with his down-home humor and affection for the small-town South. But don’t look for "Hee-Haw" stereotypes here. These Southerners stretch previous definitions. Their lives are full of beauty and mystery and grace. Rev. Pat Jobe is the former pastor of Tanner's Grove United Methodist Church in Forest City, NC. where he served for ten years. He is a native Carolinian and a committed social activist. He has been actively involved in the raising of eight children, four of whom have come to his family through the foster care system. His published books include The Best of Radio Free Bubba, The Return of Radio Free Bubba, and In Morgan’s Shadow, all from the Hub City Writer’s Project. He is the host of South Carolina's weekly TV show, "The Connection Independent Television," and can be reached at pat@theconnectionshow.org. 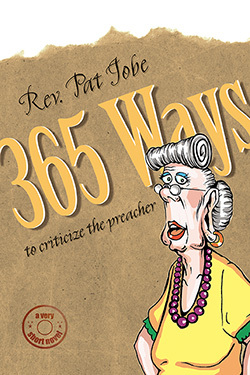 "365 Ways to Criticize the Preacher is a hilarious and moving tale of transformation! Beverly Roberts lived with me for at least a week after I read her story, making me smile." "A magnificent witness, expressed with compassion, understanding, love, and wit - showing ordinary people the power of forgiveness. Only Pat Jobe could have written it."